I just recently found out that I had been labelling this post wrong: I did two posts titled December 2017. But we’re back on track and I will be showing you the makeup I used last month once more. There was definitely a theme here. I was really into matte eyeshadows, a neutral lip and I found another favorite cheek combo. I also switched up my concealer quite a bit and tried some new foundations. In short, I have lots to catch you up on. So the eyeshadow palette you see here, the Too Faced Just Peachy Mattes, is one that I have been trying most last month. I always like to try eyeshadow palettes quite extensively before reviewing them, especially if they have quite a bit of hype surrounding them. This is no exception. You can also see three (!!) concealers here. I have really been into trying something new. Of course there are a few usual suspects too. Let’s get to the products. Urban Decay All Nighter Setting Spray – I’m still using this to set my makeup on workdays. I have been loving the fine mist of this, but also haven’t tried many other setting sprays. So I feel I have to try more before I can really review this. ELF Hydrating Primer – I finally got round to reviewing this. This is the first primer I have found that does everything I want it to do. This hydrates, makes my makeup stay on longer and it feels great. Too Faced Just Peachy Mattes eyeshadow palette – This was one palette I wanted to try after seeing the reviews. I figured it would be limited edition, but then found out it would be a Sephora exclusive. When I placed an order last November, I added this to my cart. So far I’m loving it, but the verdict is not yet in. Becca Highlighter Prismatic Amethyst – Pinky/ purple highlighters are my favorite and this is no exception. I love it. I bought this with some Christmas money and I could not wish for a better Christmas present. This suits my skintone well, yet isn’t as icy as Pearl. Make Up Forever Profusion Bronzer – My favorite bronzer this month was the recently reviewed Make Up Forever Profusion Bronzer. This is such a great one! Lots of pigment, yet not powdery at all, easy to apply and a great shade that works well on pale skin. The Balm Instain Blush – This blush was one that sat useless in a drawer for some time. But I totally discovered it this winter. It was intimidating to use because of the pigmentation, but I finally found the perfect way to apply this and it works wonders. MAC Paint Pot Painterly & TBS eyeshadow – My sturdy eyebase combo is back again once more. I’m very close to using up the eyeshadow! Fingers crossed that I will have used it up by next month. Bobbi Brown Pressed Powder – I usually go through face powder quite quickly, but not this one. I find it best applies with a sheer powder brush and thus it only takes a little bit of product to set my makeup. I’m sure I will be able to get a lot of use out of this pricy powder. MAX Factor Healthy Skin Harmony foundation & LA Girl Pro Coverage foundation – Apart from the new Maybelline Superstay and Rimmel Breathable foundations, I have also been trying the new Max Factor Healthy Skin Harmony. It only comes in 4 shades and the lightest one is a bit dark. So I’ve been mixing this with the LA Girl Pro Coverage which I own in a white shade. NYX Microbrow eyebrow pencil & L’Oreal Brow Artist – Still my current eyebrow combination are these two. The pencil is running out quickly and the brow gel works well but I don’t love it. L’Oreal Lash Paradise & Maybelline Classic Volum’ mascara – Another sturdy favorite is this mascara combination. The Paradise Extatic mascara is one that I am loving at the moment and I love the waterproof Maybelline to top it off. MAC Mehr lipstick – I rediscovered this oldie but goodie! Mehr has been a longstanding favorite but it had been collecting dust in my collection last year. I broke it out this past month and I have fallen in love all over again. Milani Eyeshadow primer – Yes and I am still doing a double prime on my lids. It’s just what I prefer. One primer, this one, makes my shadow stick and not crease. The other (my primer combo) cancels out veining and redness and provides a good base for shadow application. I know: very extra, but it works for me. L’Oreal True Match Concealer, Maybelline Fit Me Concealer & Make Up Revolution Conceal & Define Concealer – Three concealers! That’s how many I used. The Fit Me concealer is one that I am trying to use up before it expires. The True Match is one I discovered this month and the Make Up Revolution is getting loads of buzz right now as a dupe for Tarte Shape Tape. I placed an order with TAM Beauty, Make Up Revolution’s mother company, and decided to throw in the concealer as well. I have only tried it once and was impressed so far, but I have test it out more thoroughly. 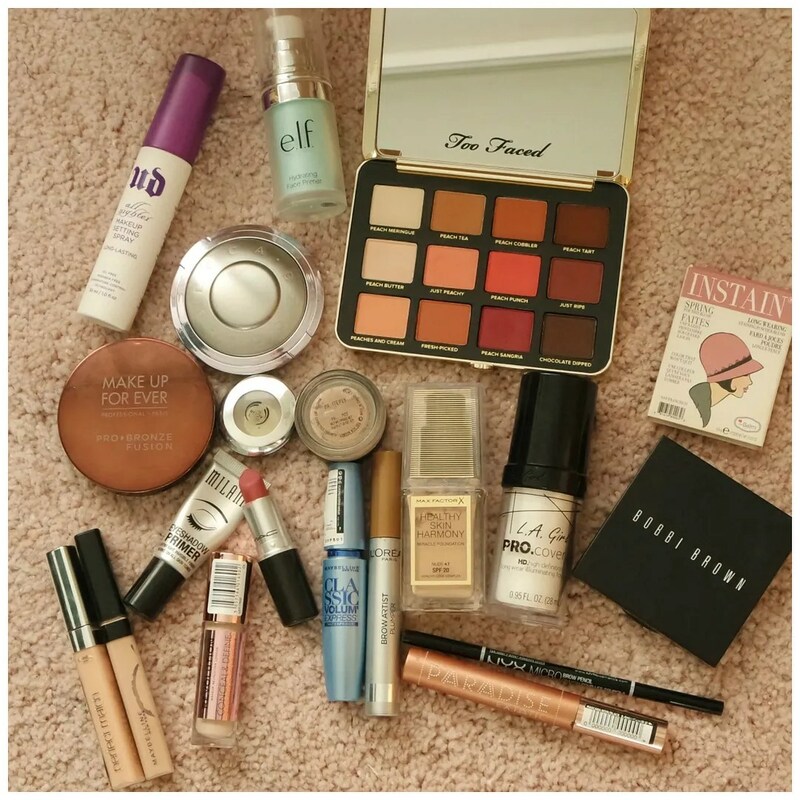 What makeup have you been using? Wonderfull and great to see what kind of make-up you has bought…. This is what I used on my face on a daily basis for roughly all of January. I didn’t buy all this last month! That would be a bit much! I’ve been liking the combination of L’Oréal True Match concealer and Erborian BB cream. It gives a nice coverage but isn’t as heavy as foundation would be. I like BB creams in the summer time. In the winter I like adding a richer, thicker foundation with more coverage as my skin is quite sallow. We have some similar items happening here. I’m also using lash paradise, the fit me concealers and a few other products of note. I’m glad you don’t just do first impressions of palettes, it’s not a true review that way. Sounds like great review material indeed! I think I may have tried a similar product by Rimmel, because they recently came out with a palette that looks absolutely stunning, but it doesn’t perform well at all. I’ve been eyeing that ELF Hydrating Primer. It’s so great that an affordable brand delivers on what you need. Max Factor Healthy Skin Harmony foundation looks exactly like the CoverGirl Vitalist Healthy Elixir foundation. It makes sense since they’re sister brands. Too bad that the Max Factor one only comes in 4 shades! The CoverGirl one comes in 14 shades! I heard that the formula oxidizes so people advise to go a shade down… but in your case, you don’t even have that option! I’m forcing myself to open palettes that I’ve been hoarding. I mean, I left my Viseart Neutral Matte Palette untouched for over a year (still not opened, I’m mustering up the nerve!). I just opened the Too Faced Peanut Butter & Jelly palette (a year in my collection, unopened), and also a few quads that I bought when I was in Japan in 2016. 😳 I’m liking everything that I’m using so far though, so that is good! Thanks! I’m in the midst of reviewing the palette so stay tuned if you want to know more. I has some similarities but Modern Renaissance definitely pulls more red/pink. Where this is more berry/plum.